The awards recognize the world’s top performing life science suppliers. Washington, DC – November 19, 2014 – Cell Signaling Technology, a leading provider of antibodies, kits and services, announced today that it has won two Life Science Industry Awards® for “Best Antibodies” and “Most Useful Website.” Hosted by BioInformatics LLC, the awards were announced at a ceremony in Washington, DC on November 18, 2014, in conjunction with the Society for Neuroscience Annual Meeting. 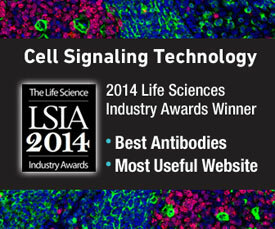 CST is dedicated to developing antibodies that align with the needs of the research community. In this way, CST is able to continually generate relevant, validated antibodies and informative website content to help drive research forward. Presented to the world’s top performing life science suppliers in 28 categories, the Life Science Industry Awards are recognized as a benchmark of excellence in the life science tools industry. Voted by BioInformatics LLC’s online network of scientists, The Science Advisory Board, over 3,000 individuals from 76 different countries participated in the nomination process. The Life Science Industry Awards are unique in that they bring the voice of the customer into the voting process and are backed up by rigorous scoring methodology, which bring these awards the highest degree of integrity. “I think as a company, our primary mission, really, is to continue to push forward the frontiers of our knowledge. We want to support the research community and allow it -- enable it -- empower it -- to make new discoveries. So, to have our efforts recognized by the research community with this award is quite an honor,” said Michael J. Comb, PhD., CST President and CEO. Cell Signaling Technology®, CST™ are trademarks of Cell Signaling Technology, Inc.